Traditionally, Māori made their clothes and adornments from native plants, and bird and animal skins. There was a great variety of garments, including many kinds of cloaks. Clothing, adornments and even hairstyles showed a lot about a person’s status, and fine clothes could enhance mana. As well as protecting against the rain and cold, traditional Māori garments were used to protect modesty and to show the wearer’s status. When the ancestors of the Māori came to New Zealand they had to adjust to a new climate, and to use new plants and animals to make their clothing. They used plants such as harakeke (New Zealand flax), cabbage trees and grasses to make fabrics. They also used birds’ feathers and skins, and the skins of seals and kurī (Polynesian dogs). 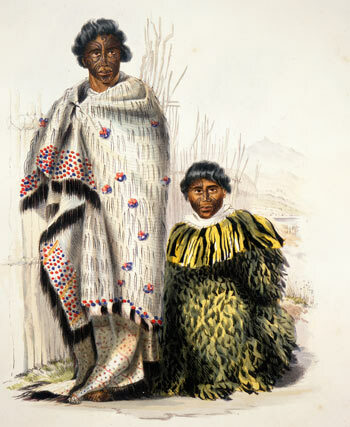 Maori garments were hand woven, using both plaiting and weft-twining techniques. The skill of weaving natural materials into fabric was passed down within families by women. Many techniques were used to create patterns and to make fabric with different qualities. The art of traditional weaving was in decline in the first half of the 20th century until groups and programmes were started to preserve the skill. The most special cloaks were worn only by chiefs. These included cloaks made of kurī skin and hair, full-feathered cloaks and kaitaka, which are made of finely woven flax fibre. Rain capes were shorter than cloaks, and kept the wearer dry. They were usually made from flax or cabbage-tree leaves. In the 2000s rain capes were sometimes worn by waka (canoe) paddlers. Māori generally walked barefoot, but sometimes made sandals from flax, cabbage-tree leaves or mountain grass for crossing rocky ground. Hairstyles could show someone’s status, or indicate when someone was in mourning. Men’s hair was twisted or knotted into many different kinds of topknots, which might indicate where the wearer came from. There is less information about women’s hairstyles, but stories record that chiefly women, or women about to sacrifice themselves, often dressed their hair. Because the head was considered the most tapu (sacred) part of the body, the hair of a high-ranking person could only be dressed by someone of even higher status. Decorative combs, ochre (red clay) and oils extracted from plants and animals were used to dress hair. Decorative combs made of bone, stone or wood were traditionally worn only by men of high status, though were later adopted by women. Feathers were commonly used in headdresses. Sometimes the entire tail of a huia might be worn. When in mourning many tribes wore wreaths of greenery on their heads. This tradition continued in the 2000s. Large black mourning caps were sometimes also worn. Necklaces and pendants were made from stone and bone. Hei tiki are neck pendants carved into a human-like form. Some pendants were perfumed with aromatic gums or oils. As well as stone and bone, ear pendants were sometimes made of bird tails, skin or feathers, or even live birds.